The term “Baroque” as applied to music generally conjures images of the concert hall or sedate church, in which black clad musicians adhere to strict formal practices handed down and closely guarded for centuries. Rumbarocco would beg to differ. A concert by Rumbarocco is anything but stuffy and guarded. In extremely talented hands, the players imbued early dance forms with new life and a distinctly Latin-American flair. 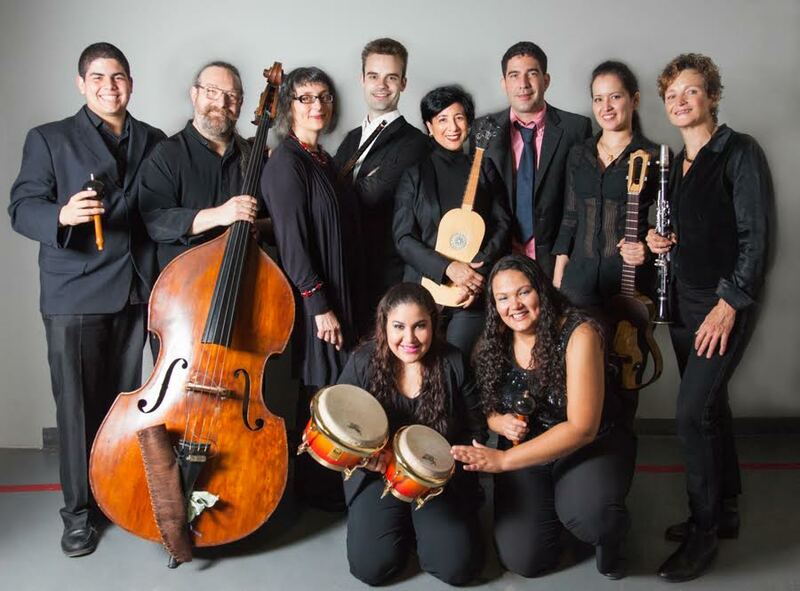 Rumbarocco self-describes as Latin-Baroque Fusion, though that label seems perhaps too modest, as what they are accomplishing reaches well beyond blending Latin-American sounds and rhythms with Baroque conventions. Director Laury Gutiérrez and her colleagues have created an ensemble that defies classification. Yes, they are using Baroque compositions for their arrangements, but with Latin-American rhythms, modal and tonal harmonies from Moorish and Sephardic traditions, even color and rhythm from North-American Jazz. Overall, the players bring to the source material a jazzy improvisatory technique that is simultaneously groundbreaking and completely authentic. The ensemble’s holiday offering at First Lutheran Church Boston on Friday also served to celebrate its newest CD release. Gutiérrez began by inviting the audience to clap the clavé rhythm as an invocation to what would become a lively evening of dance and virtuosic talent. Before long, the entire audience was moving in rhythm to the ensemble’s lively opener. Percussionists Zayra Pola Ocasio and Karolina Meireles provided a consistent and steady pulse to the evening, adorning the baroque melodies with beautifully passionate rhythmic intensity, soft when necessary and livelier than the rowdiest party in Caracas when given the opportunity. Vocalists Kimberly Ayers and Daniela Tošič performed mostly in the traditional “early music” style, clean of vibrato and with ample use of the Esclamazione di Voce found frequently in European forms of the 16th century. Interestingly, without altering their vocal style much, their voices were equally at home both when the group played more “traditionally” and when they utilized a more contemporary sound. Diane Heffner employed a rich, oaky sound with her clarinet, and commendably wrangled the finicky Chalumeau (a baroque version of the clarinet, significantly more difficult to keep in tune) into an extremely beautiful addition to the overall texture. Violinist and Gamba player Yi-Li Chang demonstrated virtuosic solo ability, and blended as necessary, adding a rich warmth to the group’s sound. Kristen Lamb navigated the ins and outs of a variety of styles as the bassist for the ensemble, equally at home on both a jazzy walking bass line and a basso-continuo style. Her ability to switch back and forth between styles provided graceful transitions both between pieces and sonic landscapes. A true standout of the evening, Carlos Capacho was wonderfully virtuosic, demonstrating immense technical mastery of the cuatro, a small, Venezuelan guitar. Many in the audience could have listened to an entire concert of Capacho on his own, but he was only showy when the music required it, never pulling focus or showboating unnecessarily—though, his solos thrilled with electric panache. Gutiérrez herself, in addition to being a gracious and welcoming host, played both the gamba and the Renaissance guitar beautifully. The collection of Christmas themed texts (with one or two exceptions) began with a trio of late 15th -early 16th-century Spanish pieces, two of which were anonymous, the third by Pedro de Escobar. Throughout the three, the group employed a variety of Latin dance rhythms, including a merengue native to the Dominican Republic, and a waltz from Gutiérrez’s native Venezuela. The second set commenced with Senhora Del Mundo, another anonymous folk melody. Though somewhat somber and subdued, it gave rise to an equally enthralling moment; as the bass provided a consistent pulse, the percussion shared their softer side, delicately accompanying the more gossamer melody. Then Rumbarroco treated the audience to a sample from its recently released album. As arranged by Gutiérrez and her colleagues, Gena the Crocodile, a children’s song written for a Russian children’s show by Vladimir Shainsky, took on a much more complex and exciting life, as hints of Yiddish melody mixed with Afro-Latin Jazz. The first half closed with arrangements of three dances from the Spanish Baroque, one anonymous, the others by Santiago de Murcia and Juan Arañés, respectively. Vaya de Xacaras, by Guatemalan classical era composer Rafael Antonio Castellanos opened the second half. Perhaps the most traditionally performed piece on the program, though it still received improvisatory stylings. La Girigonça, by 16th-century Spanish madrigalist Mateo Flecha featured improvised solos by all the members of the ensemble before coming to the show’s rousing finale. As easy as it would be to continue going on about the talented individuals, that would belie an essential truth: The success of Rumbarocco lies in just how effectively it revivifies the old. In bringing the Latin-American and North American traditions of improvisation to this rep, the ensemble makes it eons more accessible. Instead of hearing yet another mere essay on ancient music, we experience improvisations that authentically invite us in. With the addition of the rhythmic excitement of the “Latin-Baroque fusion,” suddenly we’re tapping our toes and nodding our heads. Frankly, if this concert hadn’t taken place in a church, it would be easy to imagine the entire crowd dancing. Indeed this show would well-suit an alternative venue, like a club or an event space with a good dance floor. In fact, the only (minor) complaint of the evening had to do with the church acoustics. The hard stone floor and walls overwhelmed balance, and when the percussion was at its loudest, the sound of the rest of the ensemble was overpowered. Rarely do you find an ensemble that so effortlessly bridges old world and new in such immediately and satisfyingly welcoming ways. Gutiérrez and her ensemble of virtuosos breathe essential life into compositions that have languished unheard for centuries, creating something both new and old, both local and exotic, and above all, spiritually satisfying and downright fun. Garry McLinn is a Boston-area operatic tenor, blogger, and voice actor.